I think I’m falling in love with this dip! 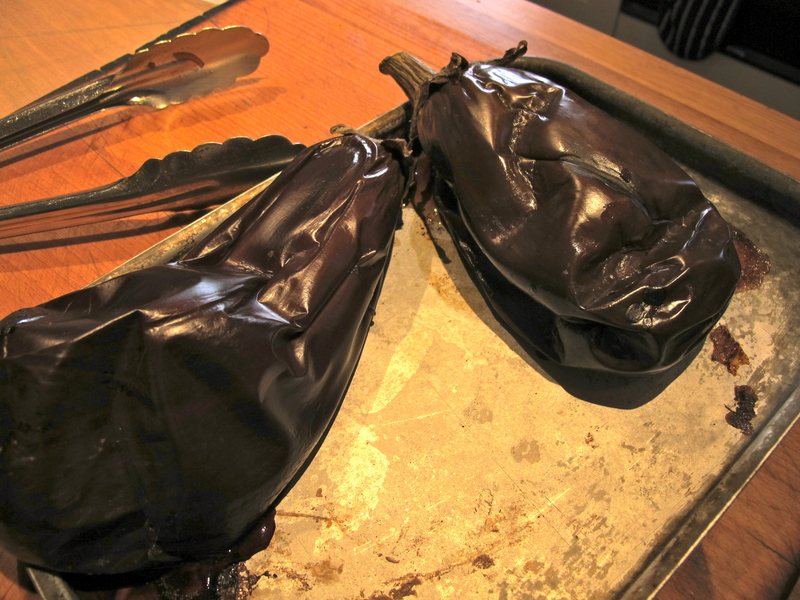 Aubergines/eggplants are singed on a burner for a smoky flavor, then roasted in the oven until the flesh is completely soft and peeled. ( You can leave out the burner bit–just won’t be so smoky)*. Things are added for regional variations–there are variations of aubergine purées all round the Mediterranean. It’s a close cousin of Baba Ganoush—in some accounts they are interchangeable. 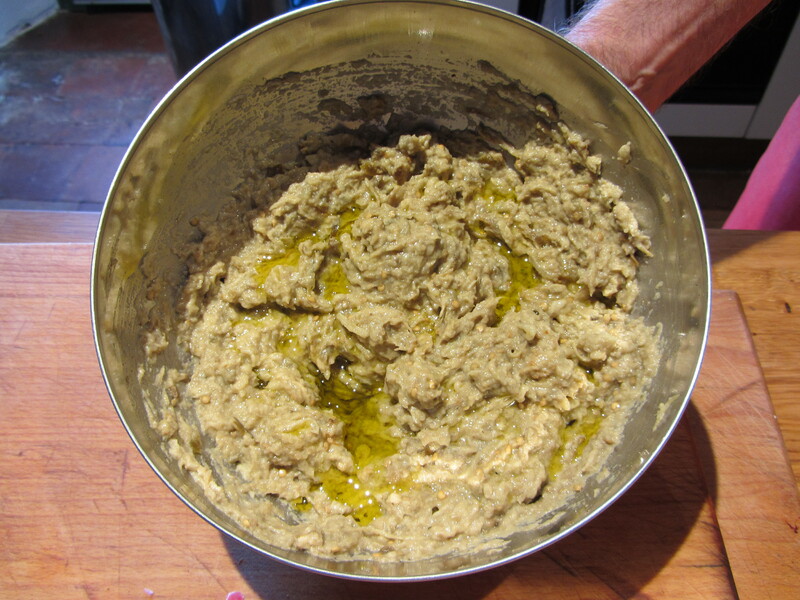 Garlic, olive oil, lemon juice, salt and sesame paste (tahini). Make a couple of slits in the aubergines–to avoid explosions! Balance one of the bulbs on a low gas flame (or under a medium grill), turning it regularly for 5 minutes to singe it. Meredith suggests a sheet of foil beneath the flame to help avoid a mess! Repeat the process with the second eggplant. 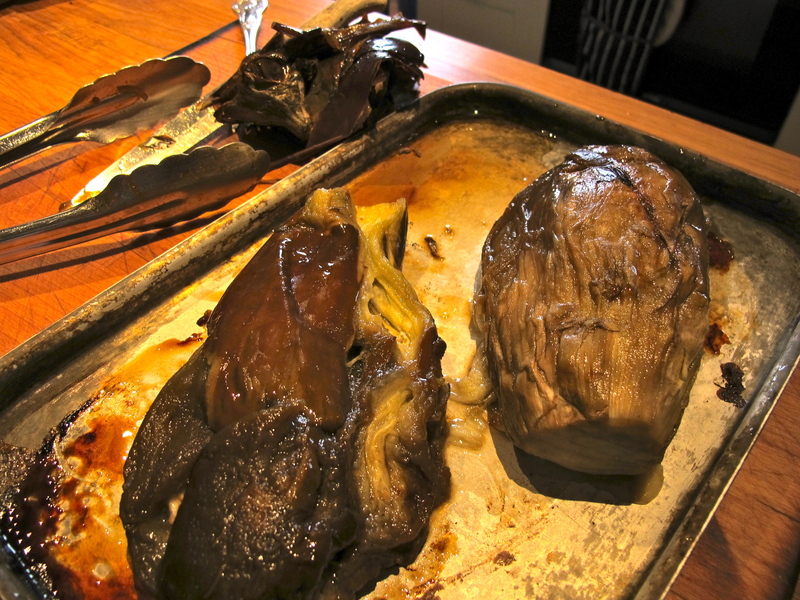 Put the aubergines onto a shallow oven tray and into the top of the oven for 40 minutes or until they are collapsed and the flesh feels soft inside. Peel them carefully and transfer them to a large bowl. Mix in the tahini, lemon juice, olive oil and salt–making a smoothish mash. Taste and add more salt, lemon juice and olive oil as needed. * Instead of burning it on the gas I also tried adding a quarter teaspoon of smoked sweet paprika to the purée–which gave it a smoky taste. Oh my word… that looks divine! Eggplant is moving to the top of my grocery list. Thank you! I love the Baba, but have never tried to make it before due to previous eggplant vs kitchen traumas. Robin makes it looks easy. do you find that yoga works hand-in-hand with your diet? I find that my practice seamlessly increases my appetite for healthy foods. It’s amazing how naturally yoga filters out the toxins and helps you maintain a healthy balance. Hello Robin I see you are back in the kitchen,hope you are feeling easier after your operation.I think I have mastered my fear of the eggplant but not quite sure I am this brave we will see in the week. Take good care of yourself .Best wishes to you both. I see you are back in the kitchen, hope you are feeling better after you operation in the week.I think I have mastered my fear of the eggplant, but not quite sure I am this brave.We will see in the week. This recipe works well if you cook the aubergines over wood on a barbecue. Avoids the kitchen traumas and defintely imparts a smokey flavour. I will try this using the bbq grill outdoors, as I do for roasting red peppers and green chilies. Robin, Do you have a special recipe using something great called orzo??? If so, tell us about it as that is a most interesting vehicle for flavors, etc. And any day now I am going to see “Poldark” all over again for the 3rd time! I did feel very sad about little Demelza passing away recently as she was such a delightful young thing in the series and had become a jewelry artist of note in her later years. Perhaps the loss of her son took something deep from her physically as well as emotionally. Love your web site and your animals, and of course your lovely wife. Lyn Wilhelm in New Jersey, formerly a Floridian. I haven’t seen orzo in a whole form. I like the rice -like shape but I prefer to work with whole wheat pastas. Any good tomato sauce would be absorbed deliciously by orzo though. Another delicious recipe! Further to your caption to the second photo, I have wondered before whether you do the clearing up or whether you have a resident serf to do the job? Hope you are recovering well from your op. We share–which is a controversial statement open to challenge. We made this over the holiday weekend. I asked my husband if he wanted to try beta testing Capt. 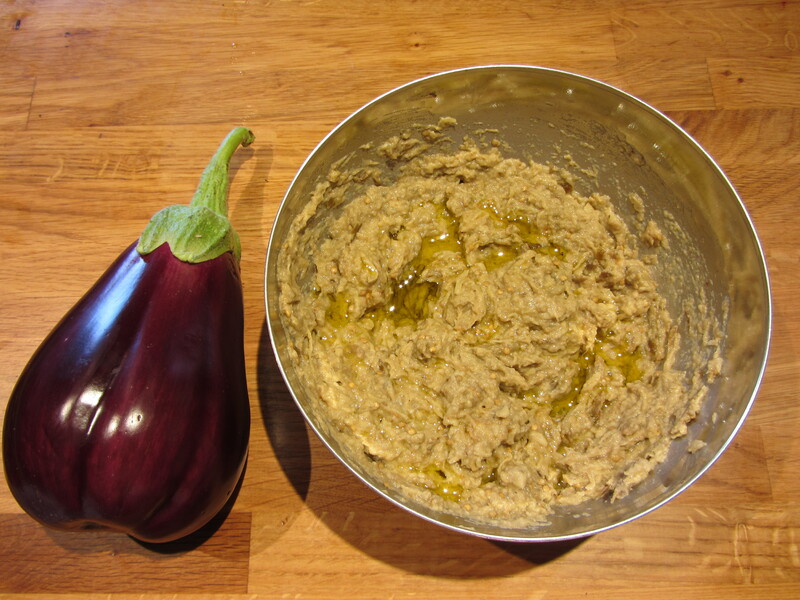 Poldark’s baba ganoush recipe. 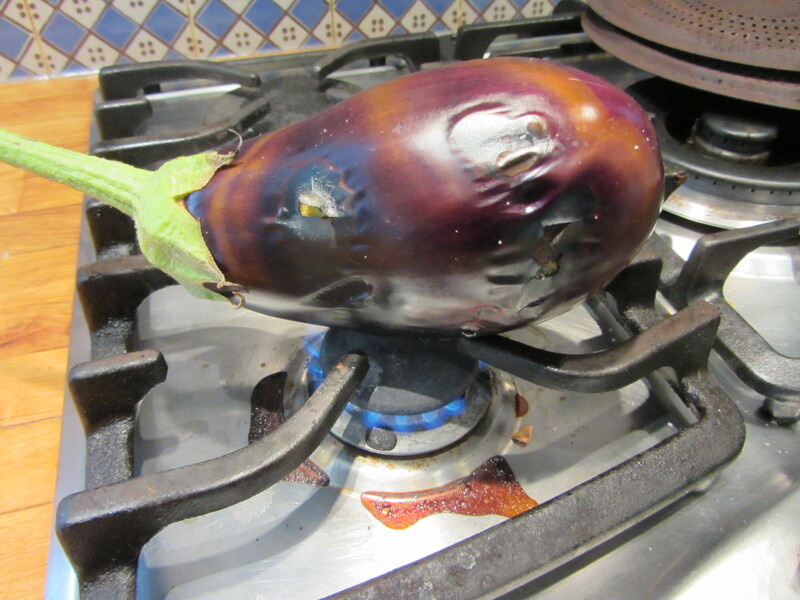 Wary of a huge and messy failure we used one eggplant and adjusted the recipe accordingly. Took a little longer to oven cook but it turned out fantastic…we demolished the tasty results immediately. Can’t wait to try it out on our friends. Hi Robin – I’m another Poldark lover and have been lurking on your blog for awhile. I’m a largely intuitive cook and have gotten much inspiration from your recipes, particularly for soups and the use of cumin and coriander. Though I must say, the highly anticipated barbecue sardines were a disappointment to my husband and I (while a treat for the cat and dog). I hope it’s not too forward for me to respond to Lyn Wilhelm’s request for an orzo recipe, as I have created one that it is rather divine. The ingredients are orzo, toasted pine nuts, sun dried tomatoes, artichokes, and grilled chicken slices. The proportions don’t need to be exact. The dressing is one part olive oil to one-half part balsamic vinegar and one-half part maple syrup (though not for a diabetic I guess), as much garlic as you like, and a half teaspoon of dijon mustard. I love your cat tales – we just put our elderly nineteen years plus Kit Kat to sleep – and your stories/images of France. I dearly want to see your part of the world, it looks so pristine and pastoral. Thanks,Gayle.I presume you soak the dried toms beforehand? Anything done with the chicken breast? I don’t remember doing barbecued sardines–we don’t have a barbecue! I’m intrigued by the name “baba” because in the “old country” it means old woman… I’ve made it! It was so easy to halve the ingredients for just one person. So easy to make it. Wonderfully tasty. Economical too. Bravissimo! Small wonder you’re falling in love with it. Thank you, dear Robin! Do you think it would be “comme il faut” to decorate it with roasted and peeled red capsicum? It’s perfectly comme il faut to decorate it–delicious idea. Pomegranate seeds are also in order. Hi Robin, I don’t soak the dried toms, just cut them up into tiny slivers with scissors. Though maybe soaking them is actually better? The chicken I grill on the barbecue (propane) with a favourite lighly spiced marinade, although doing them in the oven or on a counter-top grill (is that what they are called?) with a brush of olive oil, garlic and favourite herbs should work equally well. 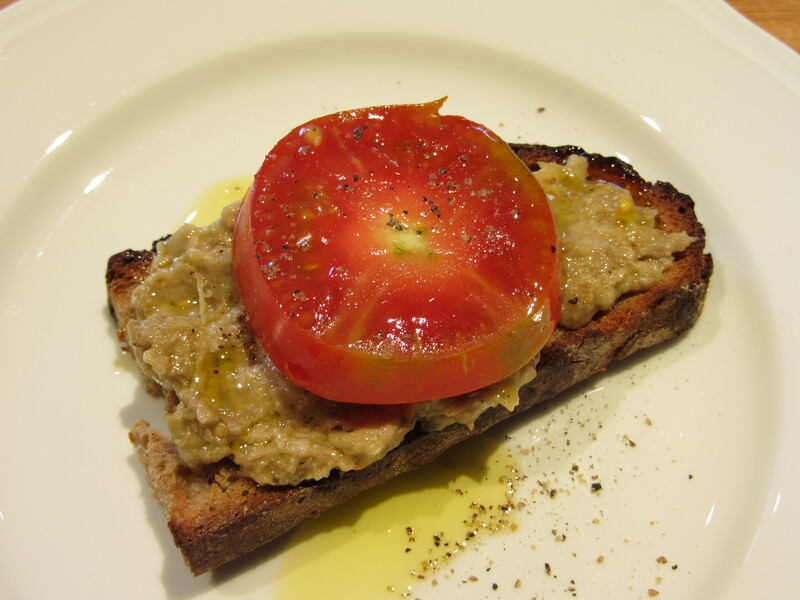 Re the sardines – I was inspired by your picture of them coupled with a Greek salad and it seemed like a good match. I barbecued the sardines because I grilling outside (propane or charcoal). But just them extremely oily and overly fishy. Fishy fish unfresh are not worth the candle! Use at least a half cup of tahini, some cumin and cayenne pepper, parsley, lots of garlic and a touch of yogurt. Spicy, yummy! I’m addicted to it! Of course the lovely splash of olive oil on the top. I just made some tonight for lunch for friends tomorrow, with moussaka, artichokes and dolmathes. Greek food rocks!